Under the direction of head coach Tony Bednarsky, assistant coaches Bart Overmat and Jae Wong, the team became increasingly cohesive and effective as the season unfolded. Contributions came from throughout the roster, with veteran players and newcomers stepping up in big moments, while a trio of senior captains—August Boland, Bailey Gano and Alex Roch—provided valuable leadership. With several tight matchups, defense was key this fall and the Knights looked to the top-notch defensive backline of junior John Baber, Boland, sophomore Ayman Kazi and sophomore Nicholas Kovalenko. September got off to a slow start, with two losses followed by a tie against longtime rival Bernards High on September 12. On September 14, the Knights dug deep to post a 2-1 double-overtime win over Somerville High. With Gill down 1-0 at the half, junior Andrew Andrew Moglianesi '19 leveled the score. In the goal, Roch and junior Mitch Fishbein made five saves apiece to hold off Somerville until Baber, off an assist from freshman Jordan Canica, scored the game-ending shot. The win set the tone for the rest of September, in which the team claimed four of its five remaining matchups. September ended with a 2-0 win over Vorhees, in which junior Dan Shen and Moglianesi each contributed a goal. October opened with a 2-0 win over Delaware Valley Regional High School, with Gano leading the offense with a goal and an assist. Freshman Cody Torgovnik added a goal, his first of the season. On October 10, the team defeated Bernard’s High 2-1 in the quarterfinal round of the Somerset County Tournament. The Knights took the lead in the first half courtesy of a goal from junior Tyler Merna off a Baber assist. Eight saves from Roch and a second-half goal from Moglianesi, off an assist from senior Andrew Amaro, secured the Knights’ victory. In Prep B competition, the Knights bested Wardlaw Hartridge 8-3 in the quarterfinals on October 28, with Gano, Merna and Moglianesi each contributing two goals. The team defeated Princeton Day School 4-0 in the semifinals. Moglianesi dominated on offense, recording a hat trick, while 9 saves from Roch kept the opponent scoreless. In November, the team defeated Holy Cross 5-0 in the NJSIAA South Jersey, Non-Public B quarterfinals. 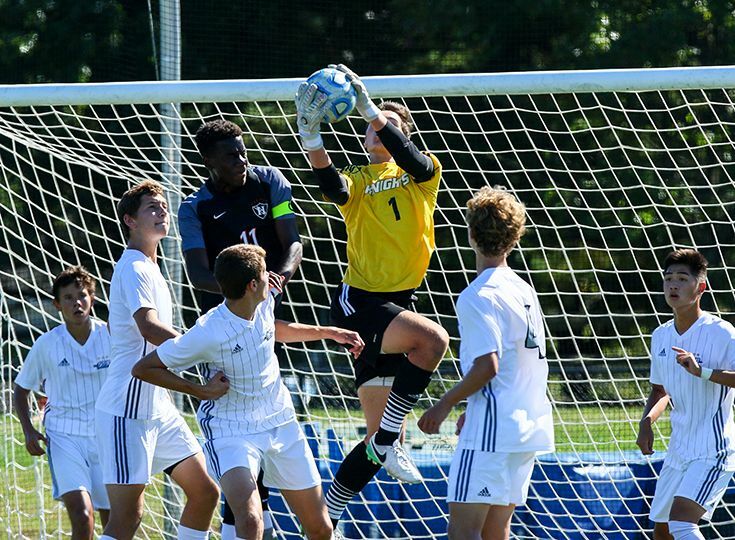 A loss to Moorestown Friends in the sectional semifinals brought the season to a close, bringing the Knights to 13-8-1 overall and 9-1-1 in their conference division. For the third consecutive year, the team claimed the Skyland Conference Valley Division championship. Next season the team will look to increased contributions from sophomores Drew Kramer, junior Gabe Myler and freshman Matthew Rossiter, who provided depth and balance off the bench. In addition, look for important contributions from the talented freshman Adam Berrocal whose season was cut short due to an injury. Expect increasing contributions from this year’s JV squad as well: sophomores Sean Beatty, Harkanwar Chadha and Luke Mortensen and freshmen Nicholas Towle and Robert Zeiner-Morrish. Stay tuned for more season wraps as well as coverage of post-season honors.